The cloth called kente, made by the Asante peoples of Ghana and the Ewe peoples of Ghana and Togo, is the best known of all African textiles. 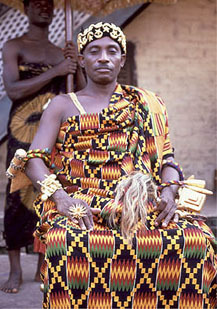 Kente's renown has spread internationally, so that it is now one of the most admired of all fabrics. This strip-woven cloth began in the former Gold Coast of West Africa as festive dress for special occasions -- traditionally worn by men as a kind of toga and by women as an upper and lower wrapper. Besides its well-known use as spectacular apparel, kente also appears in many other important forms of regalia among the Asante and Ewe, including drums, shields, umbrellas, and fans. Over the past forty years the cloth has been transformed into hats, ties, bags, and many other accessories worn and used on both sides of the Atlantic. Individual kente strips are especially popular in the United States when sewn into liturgical and academic robes or worn as a "stole." Kente patterns have developed a life of their own, appropriated as surface designs for everything from Band-Aids and balloons to beach balls and Bible covers. Kente, for many, bridges two continents, evoking and celebrating a shared cultural heritage.